The Hong Kong Stock Exchange (HKEx) has published its quarterly results showing performance in the first nine months of 2014 (Q1-Q3). Although many YoY and MoM metrics indicate improvement, a combination of R&D investment, higher operating costs and legal fees have led to a slight decrease in net income from $3.50 billion in Q3 2013 to $3.34 billion in Q3 2014. As of September 30th, 2014, the total market capitalisation of companies listed with HKEx was a gargantuan $24.4 trillion. According to the quarterly report, HKEx trading fees and trading tariff rose by 8% compared to the same period last year. Stock Exchange listing fees rose by 15% due to more IPOs and an increase in the total number of listed companies. Revenue and other income year-to-date exceeded $7 billion and increased by 8% ($518 million) compared with the same period in 2013. Operating expenses increased by 8 percent against YTD Q3 2013, mainly due to the higher staff costs on the increased headcount of the LME Group as well as higher legal fees for defending litigation in the United Kingdom and the United States of America. This was partly offset by a recovery of $54 million from the liquidators of Lehman Brothers Securities Asia Limited (LBSA) in May 2014. Year-to-date, the average daily futures/options volumes decreased by 10% while equities volumes rose 11% compared to 2013. Total open interest in all futures contracts as of September 30th was 7,980,600 contracts, up 17% from the previous year. As reported by Forex Magnates over the past year, HKEx is actively preparing for the launch of the Shanghai-Hong Kong Stock Connect (Stock Connect) next year. The initatitive will establish mutual stock market access between Shanghai and Hong Kong and is expected to generate not only significant windfalls for HKEx but also help the venue to claim a larger market share of the burgeoning RMB market growing due to China’s currency liberalisation. In the first 9 months of 2014, HKEx incurred capital expenditure of $349 million (2013: $443 million) for the development and upgrade of various trading and clearing systems, including a commodities clearing system, a Central Gateway for Cash Market trading, a new market data platform and Stock Connect. According to several HKEx executives, Stock Connect is seen as a strategic initiative to support the liberalisation of mainland China’s capital markets and the promotion of the internationalisation of the RMB. Following the announcement yesterday, HKEx shares closed marginally lower at HK$172.60 by the close of trade in Hong Kong. 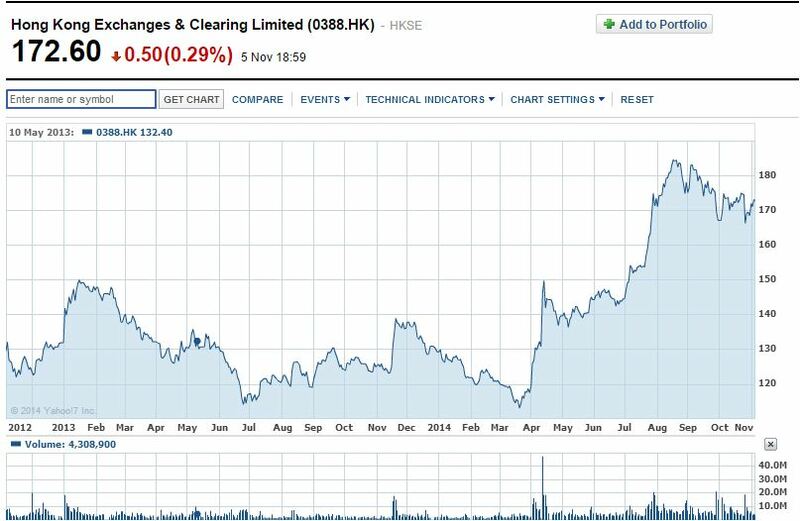 However, on a medium to long-term perspective, HKEx shares are trading ~30% higher YTD amid a visible uptrend. On the contingent liability front, HKEx is unsure of how costly or time-consuming ongoing legal challenges in both the UK and US will be. Forex Magnates previously reported on the cases in October, following the LME being chosen to administer palladium and platinum benchmarking in the interbank market. Since August 2013, 26 class actions have been filed against one of HKEx’s most prominent subsidiaries, the London Metals Exchange (LME). In a federal US court, it is alleged that the LME engaged in “anti-competitive and monopolistic behaviour in the warehousing industry in connection with aluminium prices.” Although the LME was found to be innocent, the three remaining companies involved in the legal process against the LME are expected to file appeals in December 2014. Since May 2014, 3 class actions have been filed against the LME, LMEH and HKEx in the US alleging anti-competitive and monopolistic behaviour in the warehousing market in connection with zinc prices. These cases will be heard after the aluminium warehousing cases have been settled. It is likely that the finalised judgements in the aluminium cases will set a precedent for zinc warehousing.